I was just delighted to receive a 3 Bags Full Finger Puppet Pouch recently. Don't you agree that this is adorable? The pouch is a knit bag, painted with a scene, and it holds finger puppets. The puppets can also attach to the outside of the bag, adding a three-dimensional loveliness to the scene. 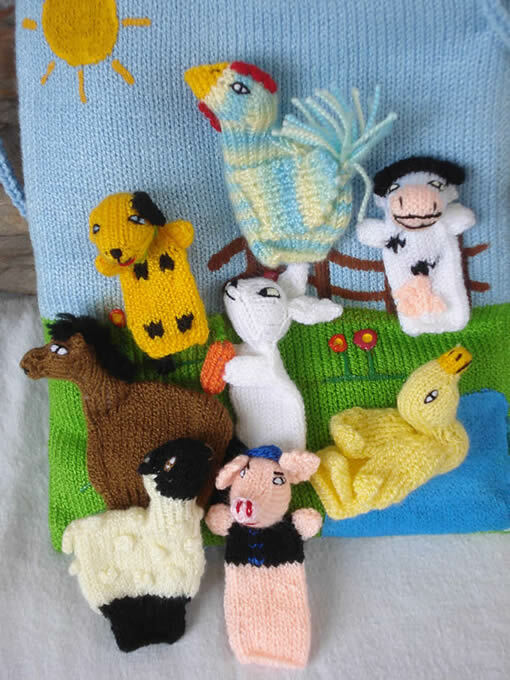 My pouch is the farm one, so it contained a cow, dog, duck, horse, pig, rabbit, sheep and a gorgeous rooster. The pouch comes with a leaflet suggesting books that would make a good match for the theme you choose. Suggestions for the books are also on the website. 3 Bags Full Finger Puppets are part of the Indigenous Crafts from Bolivia website, a company selling fair trade crafts from Bolivia. They sell online or through stores. The pouches would make a great gift of course. I think they'd be ideal for plane or car travel. They are robust, and the idea of storing the puppets inside the bag is a good one. There's enough room for other indispensable bits and pieces too. Pairing a pouch with a book or two encourages both reading, imaginative play and creative self- expression. What a wonderful gift! Kelly Burstow has a review of the pouches too. She loved the arctic pouch and puppets and has a short video showing its versatility on her blog. I also found a review by Nicole at Planning with Kids, who loved the garden pouch and puppets. I love finding toys that are the perfect match with literacy. 3 Bags Full Finger Puppet Pouches also encourage creative expression, and purchasing supports Fair Trade. Win-Win-Win! In conjunction with my review of the 3 Bags Full Finger Puppet Pouch, Sue Berlove is offering 20% off the regular price of one pouch for Book Chook readers. The offer holds until November 15, and applies to any 3 Bags Full Finger Puppet Pouch. Just send an e-mail to sue@craftsfrombolivia.com and mention BookChook25 in the subject line. Yes, these finger puppets are cute. I remember when my girl was little, we had a few of them in the car to entertain her with hand & finger puppets during long trips. I am always a bit worried when I see them: I realize somebody has worked on these puppets for a long time. Often they costs too little for the work I see. It's a tricky one, Paula, but I think if you asked the workers, they would be glad of Fair Trade and companies like that, who are committed to getting that money to the people who do the work. I guess it's also a matter of making an item attractive to potential buyers. I have also just seen a furry glove with one puppet per glove finger - all Australian animals. Very cute! I think it might be a craft project kids and parents could tackle with an old glove and scrap material.